Binding: Same fabric as the pink sashing. Quilting: All over meander with gray thread. 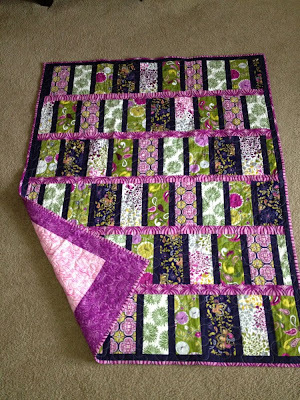 This was a very quick quilt to put together. I finished the top at the Shipshewana Retreat in 2011. Then I added a 1″ Navy border just to tone down the busy-ness of the top. I pieced 60 grey and white with black four patches. But before I cut the strips into twosies, I spilled my coffee on them and had to run them through the wash. Sigh! There are still some light coffee stains but no one will be able to tell but me. I’m not going to make a queen sized version, so I’m planning on making 3/4ths of the units and see where it gets me. I’ve finished Part 1. Gray and white with black 4 patches. I’m having knee surgery on Friday the 30th so I’ll have to catch up on Part 2 as soon as I can. Today, I also pieced and attached the thin Navy border on the Happy Child quilt. 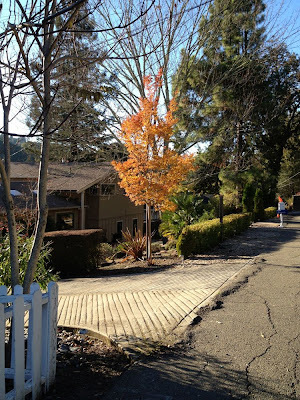 And, who says we don’t have fall colors in California? This tree is across the street from the end of my driveway. The picture really doesn’t do it justice with sun shining on it. Linking up to Bonnie’s Part 1 Linky party.